The good news about the month of May is that the Phillies went .500 for the month. The bad news is they finished May at three games below .500. Innjures played a major role with Halladay, Utley, Ruiz, and Adams all going on the DL. May was also another tough month for Cole Hamels, who dropped to 1-9 on the season. On the positive side, Dom Brown won player of the week (and possibly for the month) and finished with the league lead in home runs. 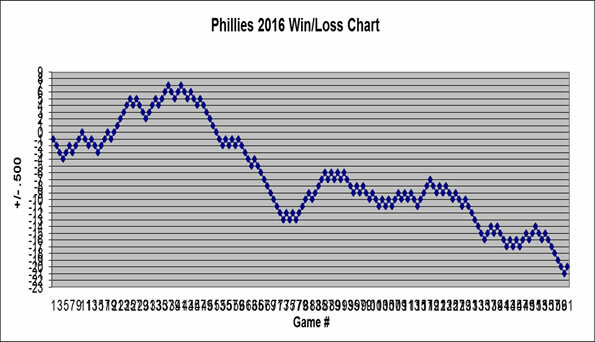 All in all, the month could have been much worse and the Phillies are still barely keeping their heads above water. Admit it. You did not see this coming from Domonic Brown. In just a few weeks, DoBo went from washed up 25-year-old to NL home run leader, likely all-star, and potential MVP. 17 home runs in a month, two straight players of the week, and Player of the Month? Are you kidding me? Brown's last ten games not only produced nearly one home run per game, but look at his slugging and OPS. I don't think I've ever seen a slugging percentage over one and an OPS that approaches two. To put his run in perspective, if you project those numbers over an entire season he would hit 146 home runs and 275 RBI. Don’t get too fond of Delmon Young because he might not be around much longer. If you don't remember, Delmon Young has a strange, hugely incentive laden contract and, as SB Nation pointed out, his contract might encourage the Phillies to cut ties by the all-star break. Before we even get to the money, Delmon Young's play on the field might be enough on its own to warrant a trip off the roster - Young is hitting .241 with a .300 OBP and 6 HR. His opposite field home runs show off his power, but it does not offset an abysmal rate of reaching base. His lack of mobility in the outfield also makes him a liability defensively. Young has a fielding radius of about two feet and treats us to wonderful stutter-steps as he approaches ground balls. You might recall Pat Burrell sprinting after balls like a newborn calf, but he could run backwards and still beat Delmon Young in a foot race. Slight power, a low on-base percentage, and poor defense is not a good combination. If the Phillies had options left on Young, he might be in Lehigh Valley already. But Young’s contract is such that they can’t send him down and will continue to pay him more and more by the day. The Phillies have already committed a minimum of $1 million to Young ($750,000 signing bonus and $250,000 roster bonus). He also has six weight bonuses of $100,000 each and makes an extra $100,000 when he reaches 40, 80, 120, and 160 days on the active roster. He also has $1.5 million in performance bonuses based on number of plate appearances ($150,000 each for 250, 300, 350, and 400 PA's; $200,000 for 450 and 500 PA's; and $250,000 for 550 and 600). Today marks the 40th day on the roster for D-Young, meaning another $100,000 in his pocket. Time to bat Dom Brown cleanup? When Domonic Brown belted a solo home run in the fifth inning last night, it appeared like just another home run in his incredible hot streak, but upon closer review it represented much more. Ryan Howard did not hit any home runs because Ryan Howard did not play. Charlie elected to sit Howard due to bad career numbers against a lefty spot-starter named Tom Gorzelanny. Not Steve Carlton, not Tom Seaver - Tom Gorzelanny. Howard had a chance to watch from the bench as Domonic Brown deposited a down-and-away slider (Howard's nemesis) off a left-hander (another trouble area for Ryan) into the seats. It was an interesting juxtaposition of the old and the new. It just might represent a changing of the guard, as Ryan Howard is no longer a top slugger in the league or even on his own team. That job now belongs to Dom Brown. Domonic Brown leads the league in home runs and leads the Phillies in six major offensive categories, yet he has not batted fourth in a single game. With Howard out of the lineup and Brown swinging such a mighty bat, last night was the perfect opportunity to move him up to the cleanup spot, but Charlie chose Delmon Young instead. What does DoBo have to do before Charlie rewards him for his hitting? What does Sunday's game say about the character of the Phillies? Sunday was a tough day for Phillies fans who still want to believe this team has a chance. Even worse than losing three of four to a last place team and dropping to 2 games under .500 was how the Phillies appeared to lay down on Sunday. After allowing four runs in the third inning to fall behind 4-0, Jonathan Pettibone worked a 7 pitch walk. The Phillies would see seven pitches or more in an at-bat just once the rest of the way, averaging 11.6 pitches per inning and just 3.9 pitches per plate appearance. Here is a breakdown of the number of pitches seen by each player in the lineup. If you ask me, Little League Baseball is our nation's true pastime. Watch a ten year old Little Leaguer if you want to see a kid truly being a kid. For a kid like myself whose position was right field and right bench and who played the obligatory one at-bat and two innings in the field, baseball was no more complicated than Big League Chew, sunflower seeds, and eye black. It is a beautiful thing to watch kids playing just for fun without a care in the world. It is not so fun when they play the same way on a professional baseball team. If you want to know what that looks like, meet Ben Revere. Benny loves to play baseball. Running hard, swinging hard, diving, and a constant smile are a big part of his game. In some ways he is everything that is right with the game of baseball. Unfortunately, there is little more to Revere's game than that. What happened to Phils "good young relievers"? The Phillies were three outs away from sweeping the Washington Nationals and moving into sole possession of second place in the NL East on Wednesday. That did not happen thanks to a blown save in the ninth and a grand slam in the 10th off the Phils' bullpen. It is the 11th loss by a Phillies reliever out of their 38 total losses this season. Their bullpen loss rate of 28.9% (11 of 38 losses) is nearly as bad as last year’s rate of 33.3% (27 of 81 losses). When the Phillies become sellers at the trading deadline (notice I said when), bullpen arms has become one of their needs. That wasn’t supposed to happen. Papelbon said during the offseason, "If we're not the top bullpen in Major League Baseball, we'll definitely be the top in the National League." Well, the Phils bullpen ranks dead last in the league this season with a 4.63 ERA.